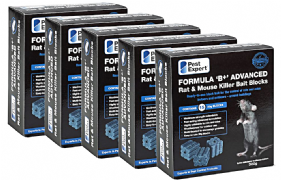 Pest Expert Formula 'B' Mouse Killer is a highly effective mouse poison containing maximum strength rodenticide, which is guaranteed to deliver rapid results. Pest Expert Formula ‘B’ Mouse Killer is the most powerful mouse poison for sale to the amateur market as it contains maximum strength Brodifacoum (0.0029%), which is 4 times stronger than Bromadiolone. Formula 'B' is made from the highest quality whole-wheat, making it highly palatable to mice and ensuring outstanding results. Ideal for use in domestic homes, Formula 'B' can be used both indoors to eradicate mouse infestations. Formula 'B' mouse bait is also suitable for rodent control in businesses including restaurants, food premises, factories and farms. Supplied with safety gloves for safe handling of mouse poison. When using any type of rodenticide, care should always be taken to ensure that it is not accessible to children or non-target species such as pets or other forms of wildlife. Our bait boxes should be used to securely house the poison. For the best value for money, please see our Mouse Killer Kits. Now supplied in easy-to-use measured 100g sachets, enabling precise baiting for improved control. Great product, great price, great company! Best rodenticide I've used! Impressive service! Product was delivered the next day and was put out at night! The poison was eaten overnight - fantastic stuff! Within 5 days this amazing mouse poison has annihilated the mouse infestation in our garden. Really happy with this product - saved me a lot of money in comparison to a professional pest controller! Great value for money! The sachets are perfect and mean you do not have to handle the poison. Delivery was fast - Pest Expert are an impressive company!